We've just finished a safety demo, and I'm still rubbing the sleep out of my eyes when a crew member asks if anyone wants to haul in the mooring line. "Yep. 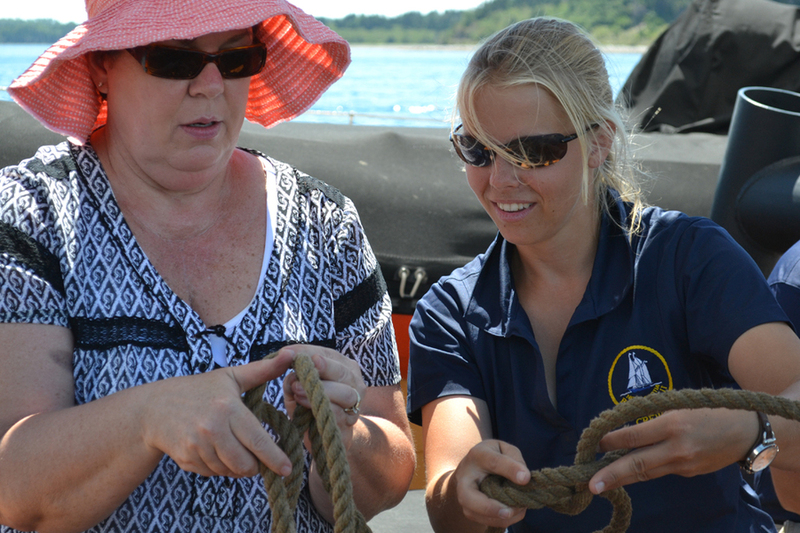 I'll do whatever you tell me to do," says the woman beside me, before I've even registered what a mooring line is. Pauline Wand has waited eight years for this. 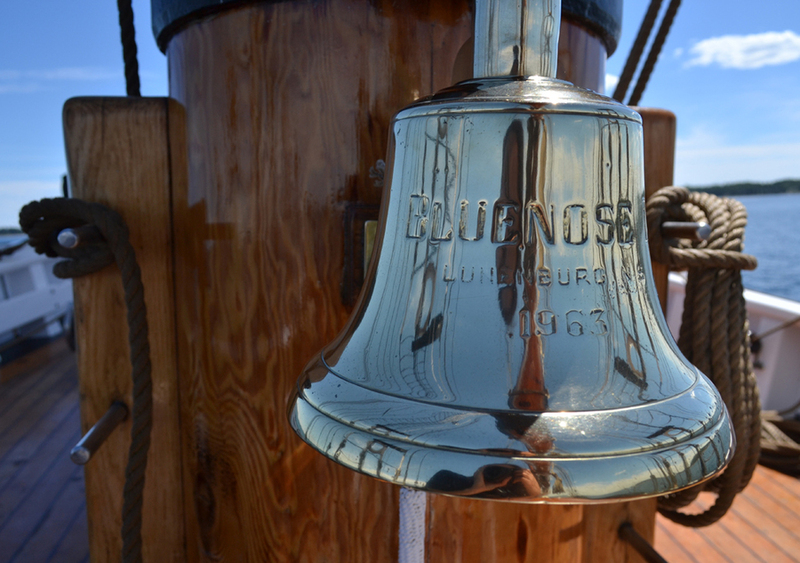 As we board Bluenose II just before 9 a.m. on the last Sunday in July, she whispers, "Oh my goodness. I'm so excited." Wand and I, along with five others, are spending the day as deckhands on Canada's most famous ship. It's part of a new pilot program that offers 10 would-be crew members the chance to scrub decks, shine brass, and do everything else necessary to keep the 161-foot vessel afloat on its voyage from Lunenburg to Mahone Bay and back. The full-day excursion immerses die-hard Bluenose fans -as one of them told me, "Who else plays $500 bucks unless you care about doing it?" - in life aboard the ship. It's a perspective missed in the regular two-and-a-half hour harbour sails, a rare up-close look at real life aboard, when most of what Canadians know about the schooner is that it's gobbled up nearly $25 million. 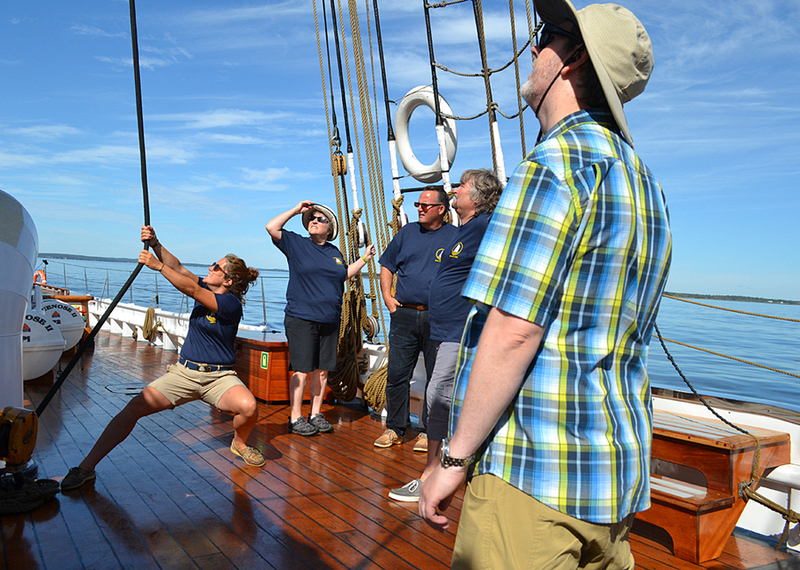 The controversy surrounding Bluenose II's multi-year refit is far from Wand's mind as we pull out of the harbour. 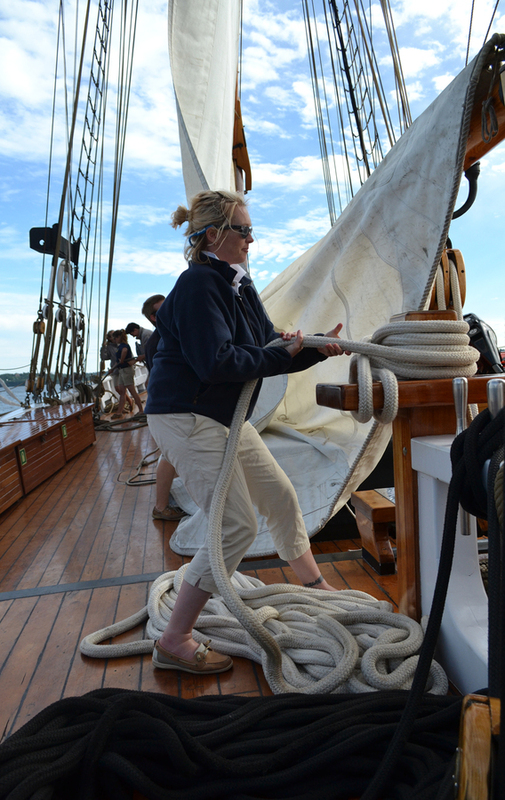 She came to Lunenburg eight years ago to sail on it, only to find it was full, so when she stumbled on the new Deckhand for a Day program this spring, she and her husband booked right away. The first outing was held on July 27, and the last one on September 4 is already full, according to operations director Alan Creaser. "It's just a romantic sort of piece of our history," Wand tells me. "I mean, as Canadians I think we're pretty humble, but we have no trouble bragging about the Bluenose and about its history, and about its success." Lunenburg's colourful outline is still visible in the distance when I'm handed a broom. 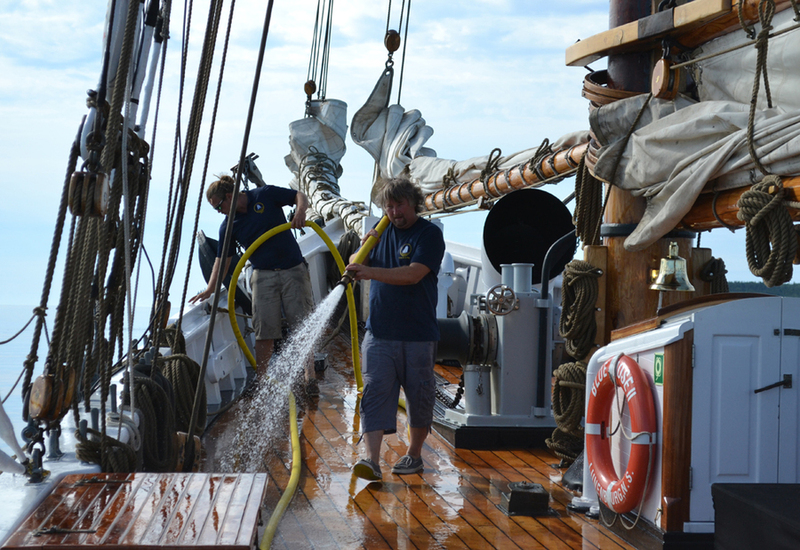 Behind me a deckhand drenches the dark-stained wood with a firefighters hose, and the crew begins to work methodically, splashing big buckets of soapy water on the deck from bow to stern. Soon, everything is wet. I curse my footwear choice just as I begin to slide sideways with each roll and dip of the ship. We're not even past the Ovens when I start to feel woozy, and a brief pang of panic sets in. I'd heard horror stories of sea-sickness from my sister who recently returned from a sailing trip from Bermuda. I soon learn the half hour of side-to-side rolling is nothing compared to what those on board have just been through. Earlier in July, nearly the entire 18-person crew, even those with steel stomachs, were sick when the ship met fierce winds on a two-week trip to Cape Breton. When the deckhands describe it to me they put their hands right up to their faces to indicate the force. 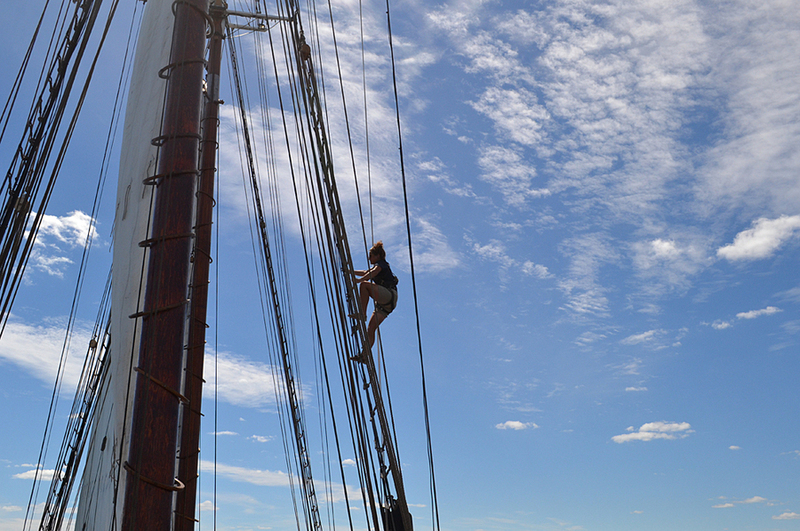 "The wind was coming right into our nose, so it was just fighting against the wind the whole way up," says first-year deckhand Sylvia Jensen. "So it was just really rocky and rolly, and it was cold and it was rainy." 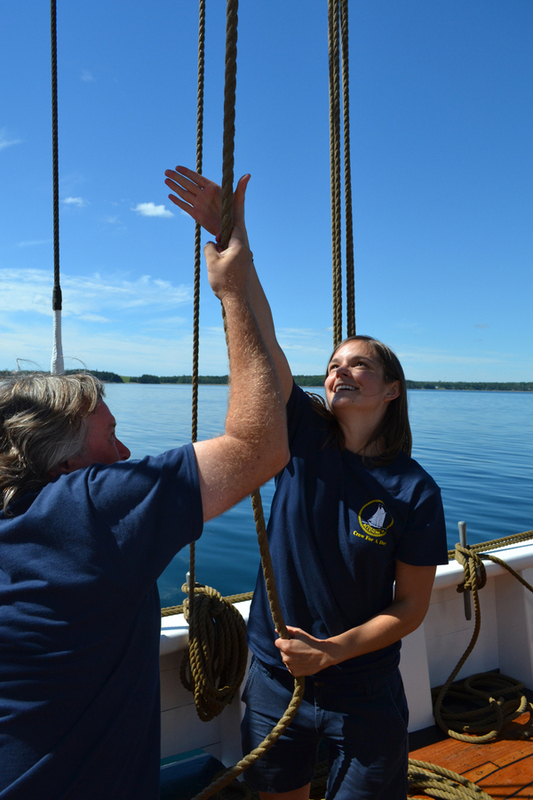 But seasickness aside, the 24-year-old from Calgary - who joined the crew in April with her sister - says "I'm absolutely loving my job, and it is a fantastic way to spend the summer." If the ship is in Lunenburg her day begins at 7:30 a.m., and after two sails around the harbour, it doesn't end until open decks conclude at 8 p.m. Then there's night watch. Our day at sea is as close to the real thing as it gets. After washing the decks and shining brass, I have the terrifying honour of ringing the bell when we drop anchor in Mahone Bay, but not before I'm warned that if I so much as ding the bell before it's time, sailors' superstition says a sailor somewhere dies. The crew is methodical and serious about even the simplest tasks, from curling rope clockwise to gently guiding huge wooden rings that hold the main sail. After lunch in Mahone Bay, everyone works quickly, guided by the voice of the first mate who yells things like, "Hold your peak!" and "Let go of your stops!" to haul the giant white sails into the sky. It's a hot, sunny day, but until now there's been little more than a breeze. But on the way home the afternoon wind picks up, and suddenly the grating roar of the engine stops. The loudest sound is the flapping of the sails. I see a fellow novice deckhand Andrew Lennox with the biggest smile heading for the stern. "This is great," he beams. Lennox, who's from Toronto, told me earlier he'd been praying for wind for two weeks. 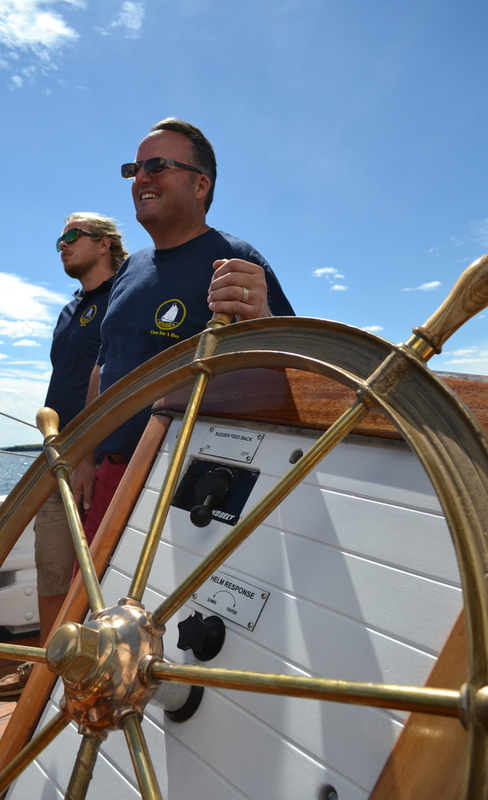 He's wanted to go on Bluenose II ever since his sailing mentor, a former Bluenose crew member, regaled him with stories from the iconic vessel. "He taught me everything I know, basically, about boats and the water. And from the time I was about 16 years old, I thought I always want to get out on the Bluenose one day," he says. There are no phones and no screens on board except for one. I'm noticeably out of place tweeting pictures of the crew hauling up the sail, or sticking my recorder into people's faces. What matters out here is who can tie a reef knot behind their back the quickest. "Life is different here. It's not computer screens all the time, and you know, sometimes it's just pulling rope as hard as you can," says Captain Phil Watson. He began on Bluenose II as a deckhand in 1987, and was promoted to Captain in 2001. He's used to hearing the negative comments that accompany the schooner these days, although he says it doesn't get any easier. "I do take it personally, because I do care very much about the ship and I care how she's perceived. But you can't change it, so you go on and just try and keep telling the positive story about the ship." As we come up past Blue Rocks and the lighthouse on our way home, he tells us to keep an eye on the horizon; the way the small port town unfolds in front of you never gets old, he says. And he's right. I realize I've never seen Lunenburg from this angle; the view sailors for generations have seen after long trips at sea. It's just far enough away that all the colours seem to form a whole, each piece where it should be. There's a wharf full of people waiting for us. I hop off the ship, and begin the walk up the hill to my home in Old Town. I'm lost once again in the details of the town, in the grid-patterned streets that are invisible from a distance. I look back and the crew is letting on new passengers, excited for their own chance on the ship, because the deckhands' day isn't over.